I was pleased the General Assembly passed a fiscally responsible state budget for Fiscal Year 2018-2019 that holds the line on spending, increases funding for education and school safety initiatives, and includes no new taxes. After several years of embracing conservative budgeting and rejecting Governor Wolf’s spending hikes, today we find ourselves on stronger financial footing than in any year in recent memory. That turnaround is a testament to the principles that have guided us through all of the recent years’ budgets – limited spending and avoiding tax increases. A number of measures have already been introduced, and our School Safety Task Force is still developing additional initiatives. We will use the summer to hold hearings, gather public feedback and work on a final product. The budget also includes an increase in funding for the Pennsylvania State Police to train three new cadet classes, which will result in nearly 300 additional troopers. The budget also recognizes the importance of three industries that have historically been among the most critical sectors of Pennsylvania’s economy: agriculture, manufacturing and tourism. We restored funding to these employers that the Governor’s original budget plan cut. Passing a fiscally responsible budget this year is an absolute necessity in the face of the daunting challenges we will encounter in the years to come. But with those challenges come new opportunities that could set our Commonwealth on the path to a brighter economic future. Recognizing the importance of agriculture to Pennsylvania’s economy, the Senate recently passed several measures to support farmers and held a hearing to explore ways to promote the dairy industry. The recent public hearing of the Senate Agriculture and Rural Affairs Committee included a detailed discussion about the current state of the dairy industry. Pennsylvania dairy farming supports 52,000 jobs and contributes $14.7 billion to the state’s economy. The dairy industry, in particular, is going through a crisis. We are prepared to roll up our sleeves and do whatever we can to provide solutions. We will partner with the administration to improve the business environment for our dairy farmers in Pennsylvania. It’s time we all identify this as a crisis and take action to assist this important industry. The Senate also approved Senate Resolution 403 designating June as Dairy Month in Pennsylvania. A separate resolution (Senate Resolution 382) encouraged the federal Food and Drug Administration to end the practice of companies using misleading labeling on non-dairy products. Members of the Senate endorsed Senate Resolution 384, which would direct the Legislative Budget and Finance Committee to conduct a study and issue a report making recommendations for initiatives to assist dairy producers in Pennsylvania. In addition to the bills promoting the dairy industry, the Senate approved two other measures that will benefit the agriculture community as a whole – Senate Bill 1171 and Senate Bill 819. Senate Bill 1171 would give farmers greater input on proposed environmental regulations that could impact their businesses. Senate Bill 819 would ensure agritourism activities – such as farm tours, hay rides and corn mazes – are authorized on farms that are part of the state’s farmland preservation program. These actions are all in addition to the new state budget that restores funding to a number of critical programs under the Department of Agriculture that Governor Wolf sought to eliminate in his February budget proposal. Governor Wolf called for a $2 million cut to agriculture programs in next year’s budget, but the spending deal passed by the legislature increases funding to the department by more than $7 million next year over the current year’s budget. The budget approved by the General Assembly provides $3 million to combat the invasive pest, the Spotted Lanternfly, increasing funding for that initiative by $1.4 million above the Governor’s request. The Spotted Lanternfly is an invasive species that threatens the grape, hops and logging industries. Products in 13 Pennsylvania counties remain under quarantine to prevent the pest from spreading to other parts of the state. Seeking to keep schools and students safe, the Senate approved a comprehensive school safety bill that will dedicate significant new resources to help prevent school violence. Senate Bill 1142 would create the School Safety and Security Grant Program to distribute $60 million in new school safety funding that was included in the state budget. The new funding is in addition to the $10 million dedicated to an existing grant program created in 2013. 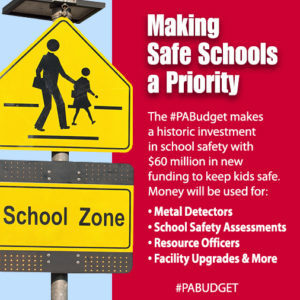 The bill was also amended to include a proposal that would require the Pennsylvania Commission on Crime and Delinquency to develop school safety assessment guidelines. These guidelines would offer a uniform approach to evaluating current security measures in every school building in Pennsylvania. The newly created School Safety and Security Committee would be made up of various experts in school safety, security, and child behavior. In addition, Senate Bill 1142 would require schools to provide employees with mandatory training on school safety and security. The school safety measures included in Senate Bill 1142 are the first phase of the Senate’s efforts to protect students. Public hearings will be scheduled over the summer to gather input from various stakeholders regarding additional steps that can be taken to improve school safety. As a strong supporter of rights for crime victims, I was proud to see the legislature approve legislation, known as Marsy’s Law, which would establish a crime victims’ bill of rights in the Pennsylvania Constitution. This year’s passage of Senate Bill 1011, a constitutional amendment, signifies one step in a multi-year process, giving voters the opportunity to approve a crime victims’ bill of rights on the ballot. Ensures a victim is receiving a prompt conclusion of the case. Earlier this year, I participated in a rally at the Capitol to support victims’ rights and call for the passage of my legislation. To date, six states have passed similar legislation, including California, Illinois, North Dakota, South Dakota, Montana, and Ohio, and efforts are underway in 10 other states, including Pennsylvania. Marsy’s Law is named for Marsy Nicholas, a college student in California who was killed by her ex-boyfriend in 1983. Her family started this movement to ensure the rights for victims and survivors of crimes and their families. Pennsylvania has a strong history of protecting victims of crime, but with this legislation we are starting the process of putting the rights of victims on a level playing field with the rights of the accused. We need to ensure that crime victims are treated with respect and dignity by the criminal justice system. It’s been awhile since I’ve reminded everyone to follow me on social media. My Facebook page provides not only legislative updates, but also those all-important PennDOT construction updates for our district. I also enjoy posting pictures of local constituents that I meet and information on other local events happening in our neighborhoods and communities. You also can follow me on Twitter – my handle is @JakeCorman. On Twitter I tend to provide more of a news update of everything going on legislatively in Harrisburg and the district. If you haven’t already, check out my social media pages.